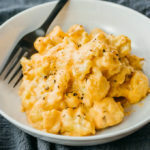 Cauliflower "mac" and cheese with a rich and creamy sauce. A healthy, no pasta version that's low carb and keto friendly. If any cauliflower florets are on the larger side (> 2 inches), cut them into smaller florets. Prepare a baking sheet lined with foil. Add olive oil and cauliflower florets to the baking sheet, mixing to coat the florets with oil and then spreading them out in a single layer. Bake at 400 F for 15 to 20 minutes, or until tender. While waiting for the cauliflower to bake, proceed to the next step to make the sauce. In a small saucepan, add all sauce ingredients. Heat for about 5 minutes over medium heat until melted and smooth, whisking frequently. Adjust the flame as needed, so that it doesn’t get hot enough to simmer. Keep warm over low heat while you wait for the cauliflower to bake. In a mixing bowl, toss roasted cauliflower with the sauce until well-coated. Serve in bowls. Evenly sprinkle parmesan cheese on top, and season with freshly ground black pepper. This recipe yields 4 g net carbs per serving (1 side serving or 1/4 of the recipe).